The first known predicted solar eclipse occurred, predicted by Thales, while Alyattes was battling Cyaxares, leading to a truce. This is one of the cardinal dates from which other dates can be calculated. A. Borrelly discovered asteroid #99 Dike. P. Gotz discoverd asteroids #566 Stereoskopiab and #567 Eleutheria. C. Jackson discovered asteroid #1712 Angola. Robert Goddard's rocket designs were rejected by the US military. Robert H. Goddard offered all his research data, patents, and facilities for use by the military services at a meeting with representatives of Army Ordnance, Army Air Corps, and Navy Bureau of Aeronautics arranged by Harry Guggenheim. Nothing resulted from this except an expression of possible use of rockets in jet-assisted take-offs of aircraft. The RAND Corporation proposed a Lunar instrument carrier based on the Atlas booster. The RAND Corporation issued the first of a series of reports on the feasibility of a Lunar instrument carrier, based on the use of an Atlas booster. A braking rocket would decelerate the vehicle before Lunar landing, and a penetration spike on the forward point of the instrument package would help to absorb the 500 feet per second impact velocity. Instruments would then transmit information on the Lunar surface to Earth. The US Army launched Jupiter AM-18 with 2 "monkeynauts" named Able and Baker aboard, the first recovery of living creatures from a flight through near space. The US Army launched Jupiter AM-18 on 28 May 1959 with 2 monkeys named Able and Baker aboard, to test the effects of cosmic radiation, increased gravity, and weightlessness on the live passengers and biomedical experiments of material housed in the nose cone. Able was a 7 pound (3.18 kilogram) American born rhesus monkey, Baker an 11 ounce (311.9 gram) squirrel monkey, and the biomedical experiments were yeast, corn, mustard seeds, fruit-fly larvae, human blood, mold spore, and fish eggs. The biomedical experiments were for NASA analysis. The animals were recovered unharmed within one and one-half hours after lift-off, after a sub-orbital flight that took 16 minutes. This milestone marked the first recovery of living creatures from a flight through near space. Telemetry data disclosed that the responses of the animals were normal for the conditions they were experiencing. During the boost phase, when the higher g-loads were being sustained, body temperature, respiration, pulse rate, and heartbeat rose but were well within tolerable limits. During the weightless period along the trajectory arc, the physiological responses of Able and Baker approached normal - so near, in fact, that according to telemetry data, Baker appeared either to doze or to become drowsy. Upon reentry, the responses rose again, but at landing the animals were nearing a settled physiological state. This flight was another milestone proving that life could be sustained in a space environment. The flight, also called the Jupiter Bioflight 2 Test/Ionosphere mission, impacted between 0.1 and 0.4 nm (185-740 m) from the target across a 1,302 nm (2411 km) range, with an apogee of 96 km (315,000 feet). The DRG (German Rocket Society) launched a 40 kg rocket from Cuxhaven to Neuwerk. The missile took 30 seconds to cover the 14 km distance and carried 5000 postcards, fulfilling a 28 year old plan for such a flight. USSR launched Cosmos 5 (also called Sputnik 15) for monitoring artificial radiation, investigation of the upper atmosphere and outer space, and development of elements in the design of space craft. Cosmos 5, launched 28 May 1962, was one of a series of Soviet Earth satellites whose purpose was to study outer space, the upper layers of the atmosphere, and Earth. Scientific data and measurements were relayed to Earth by multichannel telemetry systems equipped with space borne memory units. 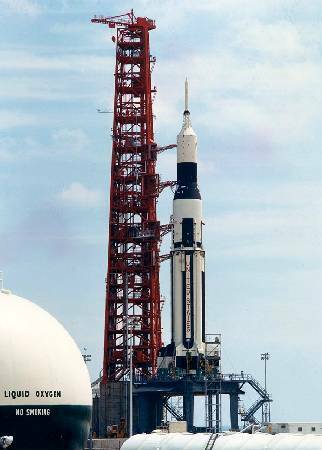 NASA successfully launched Saturn SA-6, with the boilerplate Apollo Command Module BP-13 on the SA-6 Saturn I booster, to prove spacecraft/launch vehicle compatibility. No recovery was planned; the CM disintegrated on reentry on the 54th orbit. NASA launched X-15A Radiometer/Scan/BLN Test/Aeronomy mission # 134 in which Air Force Colonel Joe Engle reached a maximum speed of 6041 kph (Mach 5.17) and a maximum altitude of 63.886 km. 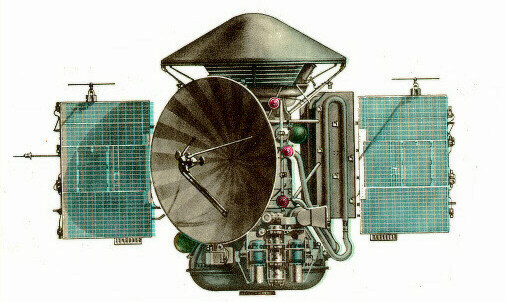 USSR launched the Mars 3 orbiter and lander, the first soft-lander to reach the Martian surface. The Mars 2 and Mars 3 missions consisted of nearly identical spacecraft, each with a bus/orbiter module and an attached descent/lander module. The primary scientific objectives of the Mars 3 orbiter were to image the Martian surface and clouds, determine the temperature on Mars, study the topography, composition and physical properties of the surface, measure properties of the atmosphere, monitor the solar wind and the interplanetary and Martian magnetic fields, and act as a communications relay to send signals from the lander to Earth. Mars 3 was launched towards Mars on 28 May 1971. A mid-course correction was made on 8 June. The descent module was released at 09:14 UT on 2 December 1971, 4 hours 35 minutes before reaching Mars. The descent module entered the Martian atmosphere, and through aerodynamic braking, parachutes, and retro-rockets, the lander achieved a soft landing and began operations. Meanwhile, the orbiter had suffered from a partial loss of fuel and did not have enough remaining to put itself into the planned 25 hour orbit. The engine instead performed a truncated burn, which put the spacecraft into a long 12 day, 19 hour period orbit about Mars with an inclination thought to be similar to that of Mars 2 (48.9 degrees). Fifteen minutes after the Mars 3 descent module was released, the descent engine was fired to point the aeroshield forward. At 13:47 UT, the module entered the Martian atmosphere at 5.7 km/sec at an angle of less than 10 degrees. The braking parachute was then deployed, followed by the main canopy which was reefed until the craft dropped below supersonic velocity, when it was fully deployed, the heat shield was ejected, and the radar altimeter was turned on. At an altitude of 20 to 30 meters, at a velocity of 60-110 m/s, the main parachute was disconnected, and a small rocket propelled it off to the side. Simultaneously, the lander retrorockets were fired. The entire atmospheric entry sequence took a little over 3 minutes. For scientific experiments (most mounted in a hermetically sealed compartment) the Mars 3 orbital bus carried: a 1 kg infrared radiometer with an 8- to 40-micron range to determine the temperature of the Martian surface to -100 degrees C; a photometer to conduct spectral analysis by absorption of atmospheric water vapor concentrations in the 1.38-micron line; an infrared photometer; an ultraviolet photometer to detect atomic hydrogen, oxygen, and argon; a Lyman-alpha sensor to detect hydrogen in the upper atmosphere; a visible range photometer covering six narrow ranges between 0.35 and 0.70 microns; a radiotelescope and radiometer instrument to determine the reflectivity of the surface and atmosphere in the visible (0.3 to 0.6 microns) and the radio-reflectivity of the surface in the 3.4 cm range and the dielectric permeability to give a temperature estimate to a depth of 35 to 50 cm below the surface; and an infrared spectrometer to measure the 2.06 micron carbon dioxide absorption band, allowing an estimate of the abundance along a line of sight to determine the optical thickness of the atmosphere and hence the surface relief. The Mars 3 orbiter also carried a French-built experiment which was not carried on Mars 2. Called Spectrum 1, the instrument measured solar radiation at metric wavelengths in conjunction with Earth-based receivers to study the cause of solar outbursts. The Spectrum 1 antenna was mounted on one of the solar panels. Additionally, the craft carried a phototelevision unit with one 350 mm focal length 4 degree narrow angle camera and one 52 mm focal length wide angle camera, on the same axis and having several light filters, including red, green, blue, and UV. The imaging system returned 1000x1000 element scanned pictures with a resolution of 10 to 100 meters by facsimile after development in an automatic onboard laboratory. Radio occultation experiments were also performed when communications transmissions passed through the Martian atmosphere, in which the refraction of the signals gave information on the atmospheric structure. During the flight to Mars, measurements were made of galactic cosmic rays and solar corpuscular radiation. Eight separate narrow angle electrostatic plasma sensors were on board to determine the speed, temperature, and composition of the Solar wind in the range 30 to 10,000 eV. A three axis magnetometer to measure the interplanetary and Martian fields was mounted on a boom extending from one of the solar panels. The Mars descent module consisted of a spherical 1.2 m diameter landing capsule, a 2.9 m diameter conical aerodynamic braking shield, a parachute system, and retro-rockets. The entire descent module had a fueled mass of 1210 kg, the spherical landing capsule accounted for 358 kg of this. An automatic control system consisting of gas micro-engines and pressurized nitrogen containers provided attitude control. Four "gunpowder" engines were mounted on the outer edge of the cone to control pitch and yaw. The main and auxiliary parachutes, the engine to initiate the landing, and the radar altimeter were mounted on the top section of the lander. Foam was used to absorb shock within the descent module. The landing capsule had four triangular petals which opened after landing, righting the spacecraft and exposing the instrumentation. The Mars 2 and 3 landers carried a small walking robot called PROP-M. The robot had a mass of 4.5 kg and was tethered to the lander by a cable for direct communication. The rover was designed to "walk" on a pair of skis to the limit of the 15 m cable length. The rover carried a dynamic penetrometer and a radiation densitometer. The main PROP-M frame was a squat box with a small protrusion at the center. The frame was supported on two wide flat skis, one extending down from each side elevating the frame slightly above the surface. At the front of the box were obstacle detection bars. The rover was planned to be placed on the surface after landing by a manipulator arm, and to move in the field of view of the television cameras and stop to make measurements every 1.5 meters. The traces of movement in the Martian soil would also be recorded to determine material properties. The Mars 2 and 3 orbiters sent back a large volume of data from December 1971 to March 1972, although transmissions continued through August. It was announced Mars 2 and 3 had completed their missions by 22 August 1972, after 362 orbits completed by Mars 2 and 20 orbits by Mars 3. The probes sent back a total of 60 pictures. The images and data revealed mountains as high as 22 km, atomic hydrogen and oxygen in the upper atmosphere, surface temperatures ranging from -110 degrees C to +13 degrees C, surface pressures of 5.5 to 6 mb, water vapor concentrations 5000 times less than in Earth's atmosphere, the base of the ionosphere starting at 80 to 110 km altitude, and grains from dust storms as high as 7 km in the atmosphere. The data enabled creation of surface relief maps, and gave information on the Martian gravity and magnetic fields. USSR's Salyut 2 space station re-entered the Earth's atmosphere after an unsuccessful mission. The Salyut 2 space station, launched 4 April 1973, was designed for scientific research and testing of onboard systems and units. Salyut 2 was intended for service as a space station for experiments and observations. On 11 April 1973, a suspected thruster problem caused craft to tumble out of control, resulting in four solar panels being torn loose from the space station, and cutting off all power to the space station. The craft reentered the Earth's atmosphere 28 May 1973. E. F. Helin discovered asteroid #2050 Francis. USSR launched a single Kosmos 11K65M booster from Plesetsk carrying eight communications satellites, Cosmos 732 - Cosmos 739, into orbit. USSR launched Progress 22 to the Salyut 7 space station. Progress 22 was launched 28 May 1984 to transport various cargoes to the Salyut 7 orbital station. It docked with Salyut 7 on 30 May 1984 at 15:47:00 GMT, undocked on 15 Jul 1984 at 13:36:00 GMT, and was destroyed in reentry on 15 Jul 1984 at 18:52:00 GMT. Total free-flight time: 2.28 days. Total docked time: 45.91 days. USSR launched a single Kosmos 11K65M booster from Plesetsk carrying eight communications satellites, Cosmos 1559 - Cosmos 1566, into orbit. Cosmonauts Leonid Kizim and Vladimir Soloviyov performed the 3h 40m PE-6 EVA 1 at the USSR Salyut 7 space station to install a truss while visiting from Mir. USSR launched Cosmos 1746 from Plesetsk, a third generation, high resolution Soviet photo surveillance satellite, "for investigation of the natural resources of the Earth." During the 21 minute (internal) EVA Mir EO-18-4, cosmonauts Vladimir Dezhurov and Gennadi Strekalov repositioned a docking adapter at the Mir space station to support relocation of the Kristall module. Linda Finch completed Amelia Earhart's attempted around-the-world flight. NASA's STS 96 (Discovery) docked at the International Space Station (ISS), the first docking of the Shuttle to the ISS. NASA announced that the 2001 Mars Odyssey orbiter's Gamma Ray Spectrometer (GRS) had detected large amounts of hydrogen, a sign that there must be ice lying within a meter of the planet's surface. Russia launched the Cosmos 2389 navigation satellite from Plesetsk. The Parus navigation satellite was placed in Plane 4, probably replacing Cosmos 2336; it was between the planes of Cosmos 2366 and Cosmos 2361. Oleg Grigorievich Makarov (6 January 1933 - 28 May 2003) was a Russian cosmonaut. He was selected for cosmonaut training in 1966. At first he did work on the Soviet Lunar program, and was training with Aleksei Leonov for a circumlunar flight. However after the success of Apollo 8 the flight was cancelled. His first spaceflight was Soyuz 12 in 1973, a test flight to check the changes made to the Soyuz spacecraft after the Soyuz 11 disaster. His second flight was Soyuz 18a, aborted shortly after launch with an emergency landing in north-west China. With his third launch on Soyuz 27 he flew to space station Salyut 6, and landed 5 days later with the Soyuz 26 spacecraft. His last mission was Soyuz T-3, during which several repairs on Salyut 6 were done. He was also in backup crews for the flight Soyuz 17 and Soyuz T-2. Altogether he spent 20 days 17 hours 44 minutes in space. After his final spaceflight he continued to work for Energia, both in the Mir space station program as well as the Energia-Buran development. He died in Moscow, Russia, on 28 May 2003 from a heart attack.